Since the SCARA robot, with its brilliant simplicity, was introduced in the late 1970s, its accuracy, speed and smooth motion have made it a favourite of manufacturers for a wide range of applications till date. 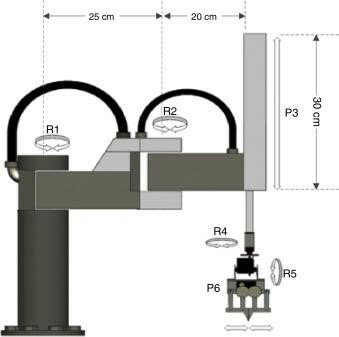 The SCARA acronym stands for Selective Compliance Assembly Robot Arm or Selectively Compliant Articulated Robot Arm or Selective Compliance Articulated Robot Actuator. A SCARA robot can perform motions similar to that of a human arm. It has a shoulder and elbow joint, along with a wrist axis and vertical motion. The shoulder and elbow joints rotate around the vertical axes. The SCARA robot configuration provides substantial rigidity for the robot in the vertical direction, as well as flexibility in the horizontal plane. The first SCARA robot was created as a revolutionary prototype in 1978, in the laboratory of Professor Hiroshi Makino, at Yamanashi University in Japan. The 4-axis SCARA was designed as no other robot arm at the time. SCARA excels in pick and place/insert operations. It has the unique ability to pick up industrial components from one location and place/insert them in another, with precision, speed, and smooth motion. However, the SCARA arm has limited motion at the wrist; it can rotate but it cannot tilt. The limited motion of the wrist is advantageous for many types of assembly operations, such as pick-and-place, assembly, and packaging applications. SCARA robots are articulated cylindrical robots having two parallel rotary joints, and provide compliance in one selected plane. The three major applications areas of SCARA robots are assembly, pick and place, and palletization. Another important area is in applications requiring constant acceleration through circular motions, like dispensing and in-place gasket forming. What’s new with SCARA robots? Four-axis SCARA robot performing pick and place tasks. Assembly line, pick and place, SCARA robots guarantee high performances in terms of productivity. Palletizing is a demanding application of stacking boxes, bags, cases, bottles, and cartons onto pallets as the last step in the assembly line before being loaded onto a shipping truck. SCARA robots are designed for high-speed, heavy payload, and long-reach palletizing applications. Lends itself to the assembly and inspection processes of electronic equipment and automobile components where precision is required. Seiko Instruments has been manufacturing watches since 1913. For the first 70 years or so, rows upon rows of assemblers in Japan precisely placed each tiny part into the watch’s frame by hand. However the need to increase production and improve quality called for the use of high-precision robots for some assembly processes. Seiko EPSON group developed a small SCARA robot in 1983 that accurately picked and placed several small parts into the watch frame, which was then conveyed to assemblers for further manual work. The production and precision increased significantly. Today, the mini G1 and small G3 SCARA robots are used to assemble Seiko watches and are accurate enough to pick-and-place tiny parts without the use of vision. The dual-arm horizontal articulated robot has the flexibility to be applied to production lines with a short product cycle and frequent changeovers, and it can safely collaborate with humans in work operations. The “duAro” is the first dual-arm SCARA robot to operate on a single axis configuration and features a payload capacity of 2 kg per arm. It can perform coordinated arm movements making it ideal for applications such as assembly, material handling, machine tending and dispensing. ABB’s SCARA 910 SC operates in a confined footprint and is ideal for the Small Parts Assembly, Material Handling and parts inspection. ABB IRB 6640 robot with PickVision Smart Camera vision was recently deployed at Atlas Copco in Grand Prairie, for machine tending. The IRB 6640 will load and unload the three Okuma lathes, present finished parts to a dot peen marking system, and then load the parts on the Reinshaw equator for comparison measurements. The cell will replace a three-person-per-shift system, increasing the number of finished parts by 70% in a 20-hour working day, while moving the displaced workers to more rewarding jobs within the facility. SR-SCARA-Pro was built exclusively for touchscreen testing of smartphones and tablets. The speed and accuracy at which it carries out test sequences make it one of the finest Scara robots for touchscreen testing for both capacitive and resistive screen types. This robot can do activities like single tap, double tap, and swipe and can also be modified for multi-touch test cases like zooming. Its force-controlled stylus ensures the safety and component integrity of the Device Under Test (DUT). Its high precision makes it possible to use it for inputs through the on-screen keyboard in the DUT. SR-SCARA-Pro can be built-to-order for horizontal and vertical test beds. They are nearly ideal for all applications, including the need for utmost precision and swiftness while handling delicate components and for long runs of operation. SCARA robots are excellent candidates for selective pick and place operations. Payload capacities and arm movements make them flexible while stacking up material. accurately. Hence they are used in mechanical operations such as packaging or stacking items on pallets or surfaces. The SCARA robot has been the oldest 4 axis friend-as it is called. When it comes to robots, one type does not fit all applications. The design of SCARA robots is undergoing a sea change as companies are taking customer pushback seriously and spending increasingly towards design and development to build the application fit SCARA robot. You could also yearn for one to suit your needs! Very Nice. I really like your blog. Very useful information. Also, Videos are nice and informative. I’m really happy to say it was an interesting post to read. I learned new information from your article, you are doing a great job. Continue. Leading corporates are now turning to top robotics companies for lowering operating costs. Successful Robotics Companies that Brought Machine to Life! SCARA Robots To Transform Test Automation Industry – The Best Cost Saving Solution!